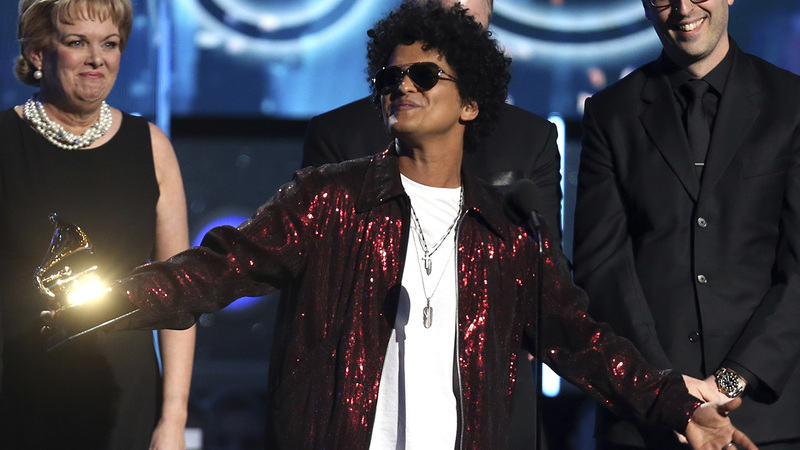 Bruno Mars owned the Grammys with his R&B-inspired album "24K Magic," winning all six awards he was nominated for at a show where hip-hop was expected to have a historical night. Here are highlights of the winners. See the full list on the Grammys website. - Best pop duo/group performance: "Feel It Still," Portugal. The Man. - Best traditional pop vocal album: "Tony Bennett Celebrates 90," various artists. - Best pop vocal album: - "Divide," Ed Sheeran. - Best rock album: "A Deeper Understanding," The War on Drugs. - Best rap album: "DAMN.," Kendrick Lamar. - Best rap performance: Kendrick Lamar. - Best urban contemporary album: "Starboy" - The Weeknd. - Best R&B album: "24K Magic," Bruno Mars. - Best R&B performance: Bruno Mars. - Best R&B song: "That's What I Like," Bruno Mars. - Best dance/electronic album: "3-D The Catalogue." - Best jazz vocal album: "Dreams And Daggers," Cecile McLorin Salvant. - Best jazz instrumental album: "Rebirth," Billy Childs. - Best compilation soundtrack for visual media: "La La Land." - Best music video: "HUMBLE.," Kendrick Lamar.